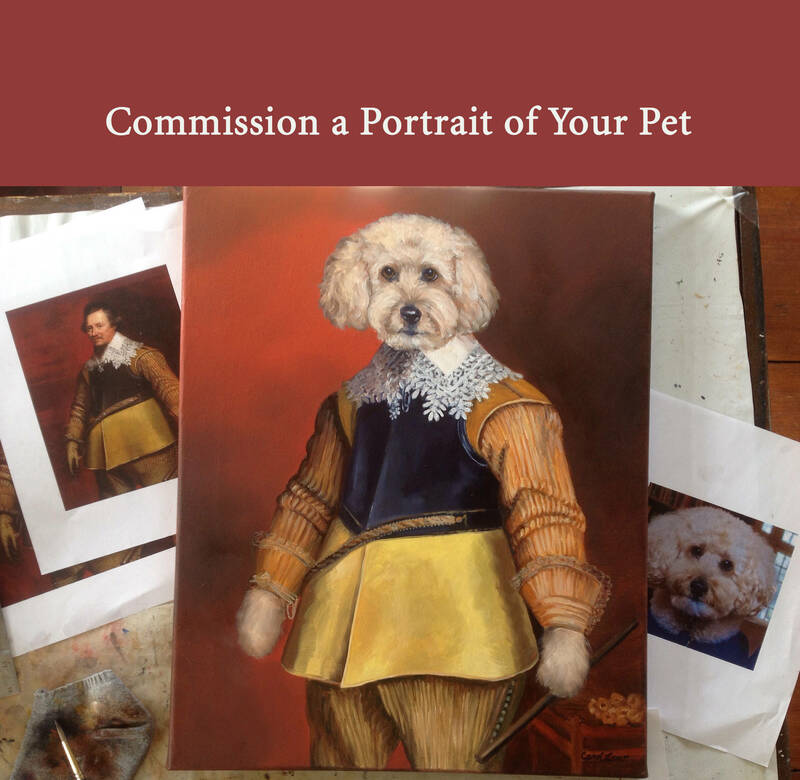 If you have a pet that you adore, and perhaps a bit of a silly side, then an Old World Pet Portrait might be just the thing for you! 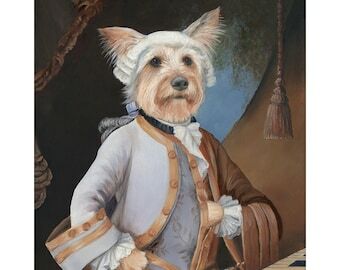 For many, a commissioned portrait has been a fun way to indulge their love for a pet, add a bit of “formal whimsy” to their decor, or give a delightful gift to an animal lover. 1. PHOTOGRAPHS. First, I’ll need some good images of your pet. Photos should be taken from the eye level of the animal, not looking down on them from above. A good sign that you've got the right angle is when you can see their chin. Head-on or turned just slightly are the best angles. Imagine you're taking a school photo! High resolution images taken in good light will help me see all the details I will need to create a great portrait. Images can be sent via jpeg format. 2) HISTORICAL REFERENCE. 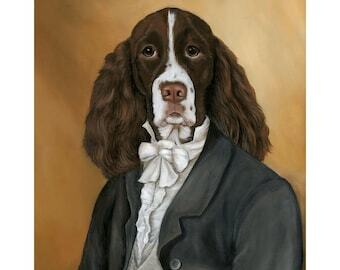 Next, we will work together to select an historical portrait that works just right with your pet and your classical style. You might want to start thinking about this by looking through the images in my Etsy Shop for paintings or characteristic you like. I also have lots of historical paintings I've gathered; once I know a general idea of what you're looking for, I can send you links to more images to choose from. 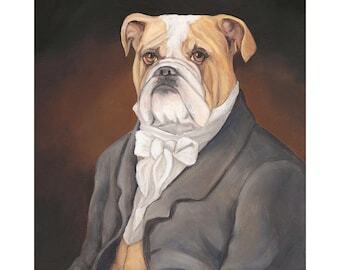 You'll have a big say in what your pet will wear in the portrait, but I will add my input so the end result is a fabulous portrait.... Now that I've been doing this for a while, I think I can say I'm a bit of an expert at painting elegantly dressed critters! 3) SKETCH. After we have pet photos, and an historical reference painting, it'll be time for me to create a pencil sketch. The sketch phase is a time when adjustments can be made without much difficulty... though we will be sticking to the photo and historical painting already selected. 4) PAINTING. Once the sketch is approved, it'll be time to confirm colors. Once these decisions are made, I'll start the painting. When the painting is complete, I will send another image to make sure that I’ve captured your pet’s likeness accurately. At this point, small adjustments can still be made if any fine-tuning is necessary. After approval, the painting will need to dry for two weeks. Then I'll put several coats of varnish on it. When that dries, it'll be ready to send to you. Can we put more than one animal in a portrait? Yes. I charge an extra $250 for each extra figure in a portrait. From the time the painting is actually ordered and the time it is received can be expected to be between 4 and 7 weeks. Why longer sometimes? If we have to make adjustments to the sketch or painting, that can add time. Weather and some paint colors can extend paint-drying time. If I'm working on other commissioned portraits, some will need to wait. And if you live farther away, it takes a little longer for shipping. If you have a deadline, ask about it and I'll see if I can meet it. What if I need the painting sooner to give as a gift? There are options! We can start the process, and a promise of the painting can be gift wrapped along with an image of the sketch or painting (that is in the process of drying in my studio). A gift certificate is another option; Then the pet owner will get to participate in the creative process themselves. Can I order a commissioned portrait if I live in another country? Yes. I'll need to know your address before I can quote you a shipping price. Also, it often takes longer for shipping time to other countries. Carol, you are amazing! Mr Darcy's portrait is now above my fireplace in the den. Love love love!!! Couldn't be happier with this painting! Thank you so much, Carol. Carol is a pleasure to work with, she is responsive and puts a lot of effort into ensuring your portrait comes out right. 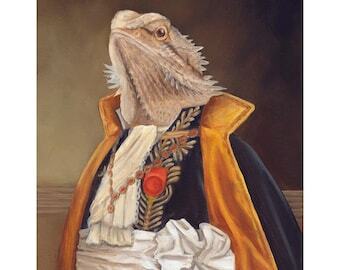 I am very pleased with my commissioned portrait and will be ordering again in the future.